Maldives has some of the best waves in the world. It cannot be considered super powerful as the swell normally reaches shoulder to head high but offers big chances of barrel and long fun waves all along the trip! No doubt the perfect trip for intermediate and advanced surfers. 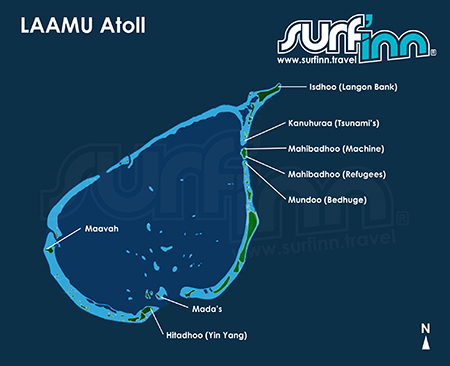 The entire archipelago can be divided into 3 different surf areas: Male Atolls, Central Atolls and South Atolls. The main differences between them are about swell size, consistency and most of all in crowd. There are some great surfing spots in the country, but just a few are easily accessible from resorts. The best breaks are on the outer reefs on the southeast sides of the atolls. Most of the spots are very close to each other, so finding good surf is easy. The best way to reach them is, no doubt, by boat. Our experienced captain knows exactly where the best waves are. Just trust us and come aboard! Please note that you can only have this experience in Central and South Atolls. Male Atolls can be quite crowded, especially between May and August. The surfing season in the Maldives depends on the Atolls but most of the archipelago is favorable for surfing from May until November, yet March and April are also good and have the best weather. 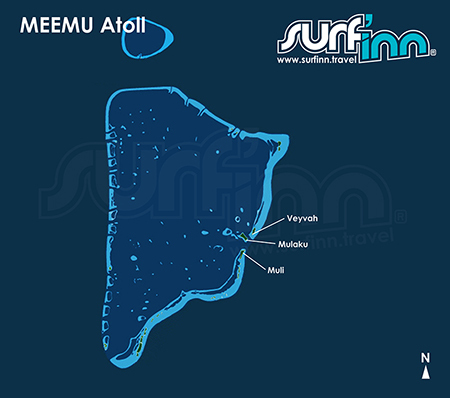 Male Atolls have the biggest concentration of surf spots in the Maldives. A big variety of spots and amazing consistency, especially in the prime summer months, make it the most popular surf area in the country. Crowding can sometimes be an issue because of the relatively easy access of the breaks courtesy of the many boats in this wave rich zone and due to the resorts that shuttle surfers out to the breaks. Although we can say that the South Male Atoll is less crowded than the North Atoll. Despite the concentration, they can only be accessed by boat or directly from the resorts because of rip tides in between the islands. A huge variety of spots scattered around these paradise islands offer you from long points to hollow sucking barrels for all levels of surfing. You just need the right guide to take you to the best wave around! Wave located in Villingilimathi Huraa uninhabited island, next to Thulusdhoo Island (on the other side of the channel). This wave holds swell size from 3ft to well over 10ft and provides rides up to 500m long. It can easily be reached if staying in Cokes Surf Camp. This is a long left-hand wave with 2 sections where you can easily get barrels on the last section of the wave. On its big swell days and perfect wind conditions, it may be one of the best waves in the world, only advisable for intermediate or experienced surfers. The best thing about Chickens is it gets the most swell out of most the breaks in North Male. Works well with winds from north-west and north-east. The name of this wave is due to the poultry farm that exists on the island, and not due to surfers’ reaction to high swells! Also close to the Island of Thulusdhoo, this is a right-handed wave recommended for intermediate surfers or experienced especially when the swell is big. The wave is a hollow and tubular right-hander that breaks over a shallow reef and is known as one of the best waves in the Maldives. The wave’s name is due to the Coca-Cola factory nearby on the island of Thulusdhoo. Works best with winds from south and north-east. Right in front of Cokes Surf Camp! This left hand wave picks up plenty of swell and reaches perfection with big south swell and north wind. You may see some shifting peaks according to tides. Since it is accessible from the shore, it is very popular within locals. It is an easy ride recommended to all surf levels. Located in the island of Thaburudhoo (on the same island as Sultans), some consider it the best wave of the Maldives, but maybe not as popular as Cokes and Chickens. When the conditions are met, it is a true World Class, that’s for sure! It is a super long, wally left-hand wave that can double in the second section. It is a fast left at 4-6ft and needs the right swell direction. Worth checking out if Sultans is crowded. It is an ideal spot for winter on North-East wind. Also known as Prison Point, situated on the island of Himafushi, this spot was only recently opened to surfers because it is located right across the national jail. Here you will find a perfect right wave fairly fast that starts off low and growing as it advances. A right-hander that works better with big swell as it forms a longer wave, otherwise has three solid sections. The name is because there used to be a prison in the island. This is probably the fastest wave in the Maldives with long walls and 3 tube sections. A Small and short left-hander that works very good with NW to N winds and rarely gets over 1 meter. Named after the island resort Lohifushi. Consistent left-hander that breaks in two sections, but, if the swell is big enough it can form a perfect long wave that barrels across the reef. This wave is exclusive to our guests staying at the Surf’inn Hudhuranfushi Island Resort with a short walk and paddle. Every year between May to June this spot hosts the WQS O'Neill Deep Blue's. This spot works well with north-west and north-east winds but it is ideal with swell from south-east and winds from north-west. This is a hollow and fast right wave that breaks over a shallow coral. It's "Goofys Paradise" or if you're fast on the backhand you will love this wave. Breaks for 100 to 150 metres and provides many barrel opportunities. Best with SE swell and NW wind. On transfer you will visit both Foxy’s and Rip Tides, so you get the best of both worlds. Slow right-hander, good for beginners and long-boarders. Presumably named because it's one of the favourite waves of the Japanese surfers. Best conditions on W-NW winds with a moderate S swell. However swells larger than 4ft ruin it. Wave that is exclusive to the guests staying at the Chaaya Island Dhonveli Resort. This wave is an amazing left that has two famous sections, one named Macarroni bowl due to its bowling type of section and Lock jaws that only works on days when the swell is big and grinds into very shallow water over the reef. A right hander breaking for 150 meters on a reef in the middle of a channel. Only accessed by boat. The wave was named as sometimes very strong currents can sweep you seaward so we always check current conditions before settling in for a session. Great wave for the longboarders and shortboarders as well as low intermediate surfers, providing very carvable walls with the occasional hollow section. Best with S swell and SW wind. Super fast right-hand wave that works better with bigger swell and can become very long with swell from the south, best conditions are found with winds from the west and high tide. If Honky's is onshore, then Sultans will be offshore. An easy right-hander with an inside a little faster. It is one of the most consistent waves and there will always be something to surf. 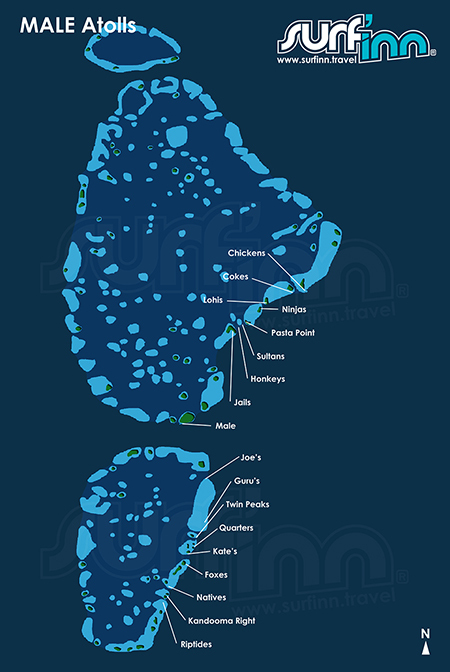 These are the outer atolls of the Maldives where just a few have been and surfed. These breaks are far less popular and it will be hard to find someone else surfing with you. Fact: During our first surf trip to the Maldives we never came across another surf charter for one entire week!! In this region, Surfinn's boat trips are still conquering and naming some of the spots that you will end up surfing just with your friends. All spots are close to each other so you can change spots within a few minutes! The Central Atolls center their attention mainly on Meemu, Thaa and Laamu Atolls, each one offering a big variety of waves. All three atolls have great exposure to S / SE / SW swells and all wind directions! 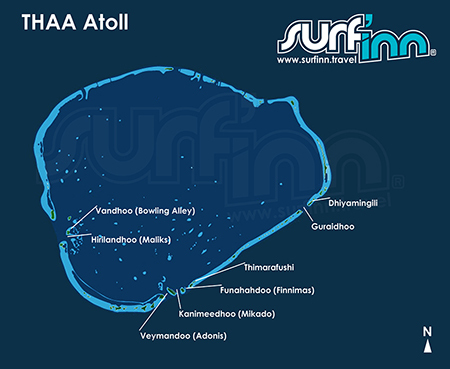 Just like Male Atolls, these three atolls offer you different kinds of waves appropriated to every surf level. So if you find a reef sucking barrel that looks rather intimidating, you’ll likely find a more welcoming and forgiving wave just around the corner or on the next reef pass. In general, spots are spread from the south facing coastline along the east facing up to the north east corner where waves wrap around. As a result you will find spots protected from all wind directions except a rare straight easterly breeze. This means that there’s always a left or a right hander in perfect conditions and protected from less friendly winds. Only during Spring (between April and June) wind can blow a bit stronger but it’s always steady off-shore. As the only means of access to these atolls is by charter boat, those lucky enough to have ventured there have been reaping the rewards, and with nobody else around. Crowd is not an issue in the Central Atolls!! Besides the difference in crowd you can expect bigger waves than in the popular Male Atolls. Numerous world class breaks have been discovered in the Central Atolls, mostly in the form of right-handers. 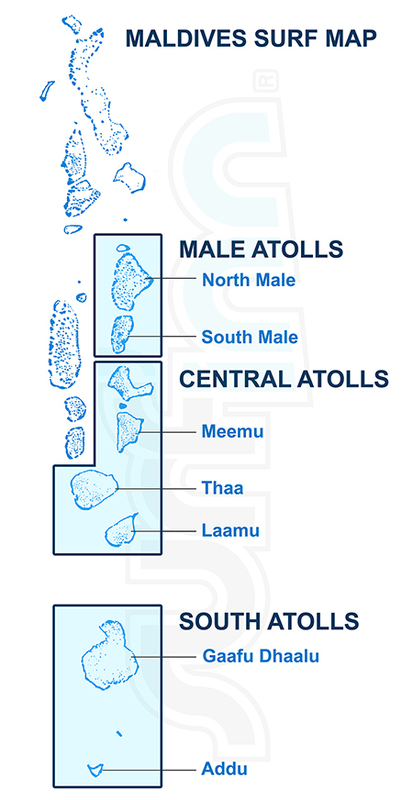 The typical Central Atolls pack combines surfing in the Male, Meemu, Thaa and Laamu Atolls. To be worth it, the trip to Meemu must last at least 10 days. For entire satisfaction, we strongly recommend that you book two consecutive weeks in order to enjoy the surf in both the North Male Atoll and the Central Atolls. A very fast barreling right hander with long walls and hollow. Can be shallow, but still with a safe ending. Very well protected from southerly winds, needs bigger swells to work. Usually picks up more swell, good in SW winds, right hander with long walls and easy exit on the corner. This is another two ways wave. The right can hold bigger swells, easy to ride even when it is big. Good for intermediates and even beginners. The left is faster, very shallow and works only in certain types of conditions. Perfect left hander with long wall. Easy take off with several options with long rides. Not too heavy - great fun! This right hander needs bigger swells and northerly winds to present its nice barrels. Can have fast, hollow and shallow sections. However it can be a very long wave with the right conditions. Finnimas is a shallow fast lefthander with some great barrels that needs NE, N or light NW winds to break perfectly. The most consistent wave in Thaa but less protected from winds. It’s a very powerful right hand wave with fast, hollow walls that can produce some great barrels. Outside Mikado works best with high tide and when pumpin, it gives you the surf of your lifetime! Bedhuge is a remote, perfect right that breaks on big SE swells and any W wind. Although, it’s worth to try if other breaks seem very heavy. On the northeast tip of the atoll is Isdhoo or Langon Bank, a rarely surfed right hand that comes alive in big S-SE swells and very well protected from southerly winds.. This spot is rarely surfed due to a lack of anchorage. Another wave to consider if the swell is big and the wind blowing from the NW, it may be worth heading inside the pass to Mada's, a short and shallow left. This is pure perfection in big swell conditions! Unfortunately this wave is always small and currents can get very heavy to make this impossible to surf. It has three sections: the outside, the corner and the inside. All three parts are connecting when the swell is right and make the wave tons of fun. The reef is pretty straight and shallow here but you can pull into the barrel just after take off. You have to get some speed to get to the corner and to performance turns in mellower wave. Stay on from there to the inside and you will get another long and heavy barrel section. This left hand picks up probably the most swell of all east facing spots in the Laamu atoll. It's an excellent wave with the right swell angle but since the reef is quite straight it tends to close out though. It is well protected from westerly to northerly winds. Offering three super fun sections starting with a sweet barrel on the takeoff, then a fun wall for some turns and another barrel at the end section. Yin Yang is the most consistent wave in Laamu, working best under strong SE swell when thick barrels and a powerful inside section can be punishing. The wave starts out quite friendly with a nice wall before it backs offs for a while and then becomes agressive, offering a long inside section that can produce some amazing hollow barrels. Outside is a mellow wall with safe rides in deep water. South Atolls still remain the last frontier on surf trips. This is one of the most remote areas on the planet where charter boats are the only form of access, making this an exclusive and relatively expensive surf trip, but unlike the Mentawai's, only a few boats operate in the area. Due to political reasons a special government permit is required for boats to travel here. The first surf boat charters only began in 1993 but most of the surf spots still remain secret and yet to be found. Only a few have been revealed and we’re ready to take you there! While the other atolls have their prime season between April till September, South Atolls have a more extended season from February till November. Some say that the best conditions occur between February to April just before the southwest monsoon begins and September to November when it is coming to a close. 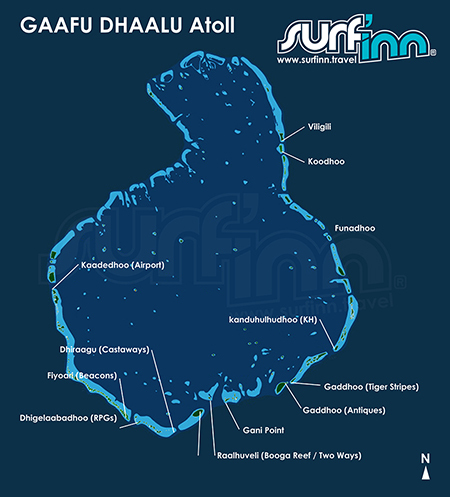 Gaafu Dhaalu Atoll (also known as the Huvadhoo Atoll) is generally known to have the best conditions for surfing in the Maldivesbecause it picks up more swell than any other atoll in the Maldives and from every direction. The Gaafu Dhaalu offers the greatest quantity and variety of spots. This means plenty of consistent swell and some world class breaks. There is everything from barreling and hollow walls to soft and never ending playful waves. Not much has been written about Addu Atoll because it still remains an uncharted area where many waves are yet to be found. Some expeditions have recently found a good left hander on the island of Vilingili and a right hander just south of Gan, yet information remains somewhat limited. This is the southernmost atoll, lying just below the equator. Addu along with Gaafu Dhaalu has the best swell exposure in theMaldives but doesn’t have the perfectly shaped soft breaking waves. It is technically more challenging as it requires more flexibility to make the sections or to get enough speed out of the less powerful faces. 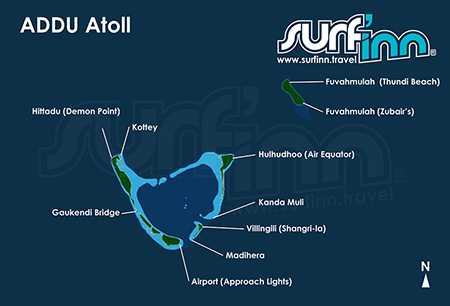 Most of surfers still choose the Male Atolls and Central Atolls for their surf trips. So, this South Atoll pack is available upon request and must be booked in advance. If you don’t want to surf the lefts in Tiger Stripes, then you head up to Antique’s rights. This is considered to be a second choice wave which is always a couple of feet smaller and way more forgiving than the lefts. Advanced surfers only! Not like much of Maldives's waves, this one has an unforgiving shallow reef. Just remember that SW swells will break down the reef, but a SE swell will create peaks slamming straight onto close-out sections of coral. A very long right-hander, very exciting especially at 4 to 6 feet and protected from SW-W winds. This wave is surf able all the time, all swells, all tides and all sizes. It is a good length for an easy ride and nice sections for some moves. Is a soft right-hander that can be surfed on all tides but better surfable in high tide when the swell is bigger than 4 feet due to its shallow reef. Just like Beacons, it gets good with N wind. Surfing here is the idyllic setting of the Maldives with plenty of marine life around and an isolated island just in front of the line-up. Another right-hander, protected from the south-south west winds. A hollow wave that that breaks hard on shallow inside reef and so it’s better surfed at mid-high tide. This is maybe the wave that handles the biggest swells at all tides. Right next to Two Ways, there’s this very consistent left hander, working on any swell size. This wave can be surfed at every tide and handles different wind directions but best conditions occur when it’s small size, low tide and E winds. Beautiful long wave with two sections: take-off on hollow wall and some little nice tubes at the inside section. A fun left-hander, not very hollow but with long workable walls and a complicated take off into a long speedy wall before presenting an inside tube section that gets smooth and breaks out easily in the channel. Very consistent and can be surfed at all-tides. Best conditions with west-north west winds. This is a simple and neglected wave when small but can be really challenging in strong swell. This is a right and left-hander but the rights tend to be better, funnier and longer. It’s not hollow and it needs a big swell to reach perfection. So, this is one of favorite waves within intermediates. Fun, peeling, long walls with a bit of depth to the water. Gaukendi BridgeA left hand located on the south side of the bay that may be the right choice on those days of small swell. You can expect short but fun rides. This could be considered a spoiled wave as it picks up a lot of swell but it needs a very specific set of conditions to be surfed. In the right wind directions it offers a fun lefthander with 2 sections and several take off points. The waves start breaking in deep water and provide some heavy barrels on certain spots of the reef. The bottom of the reef is a bit rough which makes the wave funny and changes from heavy to soft in just a few meters. A new resort built in Viligili island named this wave. On small clean westerly swells, you can find a funny right hand reef-break wrapping along the east coast of the island. SURFINN © 24-04-2019 02:26:00. ALL RIGHTS RESERVED.